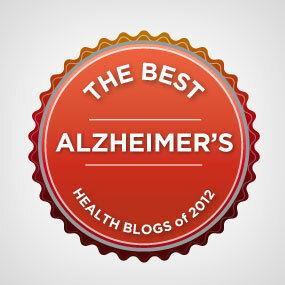 Healthline listed the Alzheimer's Reading Room first in the list of best Alzheimer's blogs of 2012. The blog they listed number two did surprise me. Alzheimer's Front Row (AFR). Why you ask? The AFR is one of the companion blogs of the Alzheimer's Reading Room. Here is what Healthline said about the Alzheimer's Reading Room. The Alzheimer’s Reading Room is what it claims to be – and more. This comprehensive site is run by full-time caregiver and gifted advocate Bob DeMarco. Filled with wonderful contributions from a variety of talented writers, this site offers everything you need to know about the challenge of caregiving, learning about your loved one’s condition, and taking care of yourself as well. Thanks to the tireless efforts of everyone at the Alzheimer’s Reading Room, you have a go-to place for advice, education, and an occasional laugh. Stop by, and start feeling empowered to handle life as a caregiver. I like it. Thank you Healthline. Please notice these words -- "Thanks to the tireless efforts of everyone at the Alzheimer’s Reading Room." Those words refer to the Collective Brain of the Alzheimer's Reading Room. All of us here including: those of you that take the time to comment, add your insight, advice and perspective. So, thanks all the way around.